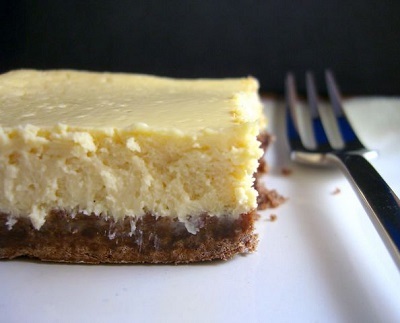 Over the holidays, I found myself with the need to make a dessert for some guests – surprise, surprise, right? I somehow got it into my head that a bundt cake would look good, not to mention that since these guests happened to be family members, I didn’t feel the need to go over-the-top and made an especially elaborate dessert. I wanted something that would go well with a bit of cofee. My first inclination was to make the pear cake yet again, but I ultimately decided that the inclusion of chocolate into my dessert would probably make it more appealing to everyone. So after much deliberation and a few twists, I arrived at a double chocolate peppermint cake. 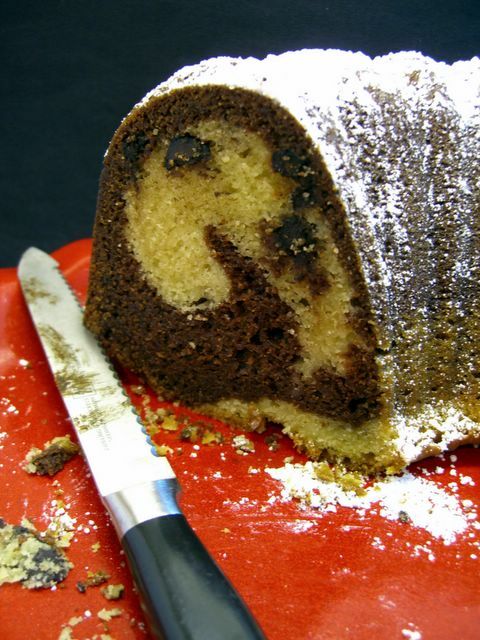 The cake is a black and white swirl bundt that uses melted bittersweet chocolate in the black layer and melted white chocolate in the white layer. I spiked only the white layer with some peppermint extract, which added a lovely flavor without being too overwhelming, since it was tempered by both the plain chocolate cake and the chocolate chips that I stirred in to both batters before baking. The finished cake was moist and minty, with a good hint of chocolate that could be emphasized even more if you add a chocolate glaze, rather than a simply dusting of powdered sugar. It was substantial, but neither as heavy nor as dense as a pound cake. It went beautifully with coffee and even better with hot chocolate. Preheat oven to 325 degrees F and grease a 10-in. bundt pan thoroughly with cooking spray or butter. In a large bowl, cream together butter and sugar until light. Beat in eggs one at a time until fully incorporated. Set aside. Combine vanilla and buttermilk in a measuring cup. Set aside. In a medium bowl, whisk together flour, baking powder, baking soda and salt. Working in three or four additions, alternately add the flour mixture and buttermilk to the butter mixture, mixing only until just incorporated and no flour remains. Scoop half of the batter back into the medium bowl. Into one bowl, stir in melted bittersweet (or semisweet) chocolate. Into the other half of the batter in the other bowl, stir in melted white chocolate and peppermint extract. Divide chocolate chips and stir half into each bowl. Pour chocolate batter into prepared bundt pan. Smooth surface. Pour white batter evenly into bundt pan and tap gently to smooth surface. Do not swirl the batter. Bake cake for 70-75 minutes at 325F, until a tester inserted in the center of the cake comes out clean and the cake springs back when gently touched. Allow cake to cool in the pan for 20 minutes, then turn out onto a wire rack to cool completely. I recently started collecting Bundt pans, old ones and new ones, and I’ve also been collecting sweet and savory recipes to make in them. This looks like a wonderful recipe; I love the combination of chocolate and peppermint. I really like the swirl in that cake. There’s almost a yin-yang affect. Sounds like it would pair really well with green tea. Do you think that you could use a different kind of extract like almond? I love mint but I thought a almondish cake would be nice for Thanksgiving. Great looking cake but it was really big. I thought it would come over the top. But it turned out beautiful. It seemed to stick a little in the pan so I just left the pan on it after I turned it over and let it relax a bit and sure enough the pan came off without a hitch and the cake is big but gorgeous. Thanks for a great recipe.